Since we aren’t eating grain flour, that cuts down on desserts to eat. Fortunately, we are not dessert eaters at our house. (We eat fruit normally at dinner and sometimes refer to it as “dessert.”) However, there are certain occasions where we want to celebrate with something special that isn’t full of refined carbs. The original recipe is at Mark’s Daily Apple, but I’ve modified it and added quantities where he had none. Process the nuts and seeds in a food processor until ground into a fine flour. Then, put the flour into a bowl. To the food processor, add the dates, cocoa powder, coffee, and a 1/2 cup of shredded coconut and grind until fairly smooth. Then, add this mixture to the flour in the bowl. To the bowl, add the coconut oil and mix by hand until the mixture can be rolled into small balls about 2 inches in diameter. 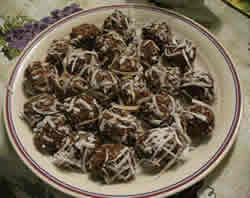 Add the rest of the coconut to a plate and roll each of the balls in the coconut. Then, refrigerate the balls to firm them up. Makes about 25 balls, each 1.5 inches in diameter.